Maximum Engraving: 7 Lines with up to 20 characters per line. Our diamond shape plastic key tags are perfect for permanent identification of keys, valves, cases and more. These tags are 1/16" (.060) Thick, 2 Ply outdoor rated , UV Stable engravers plastic for long life. Lettering is engraved by removing the surface color and exposing the core color beneath. Custom engraved diamond shape key tags are 2" x 2" in size and .060" thick. The keyring hole is .180" in diameter. Maximum 7 Lines. You can fit about 20 characters to a line. The more letters you use, the smaller the text must be. 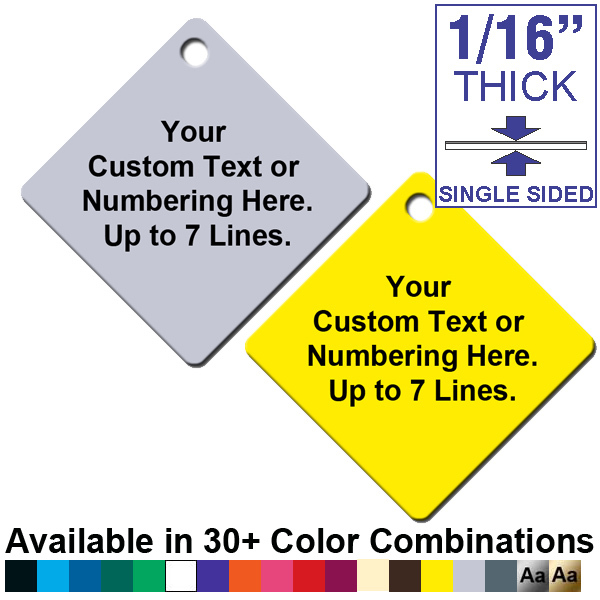 Call us for custom sizes, colors or anything else you need in key tags - we can produce almost any size and shape you desire. Price includes your personalized text or wording on FRONT side, up to 9 lines.